Get great discount on Sony Cyber-shot DSC-HX300 Point & Shoot Camera | Online India shopping best deals, discount,coupons,Free offers. The Sony Cyber-shot DSC Point & Shoot camera is a highly capable device and is also great for beginners and intermediates alike. 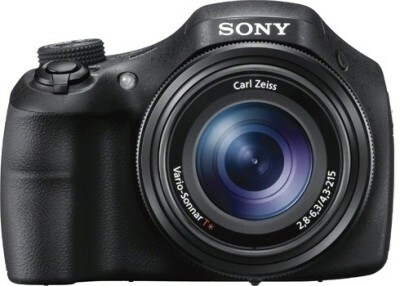 Sensor Technology The camera comes with a powerful 20.4 MP EXMOR R Sensor. This CMOS sensor is a great choice for high speed photography and even for low light conditions. The BIONZ image processor allows for high quality images. Optics This camera is equipped with Carl Zeiss optics and is also supplemented with the Vario Sonnar T Lens. This arrangement is highly useful for high quality photos along a wide range of lighting conditions. The lens is capable of a zoom level that is 50 times more than the standard focus. The 100 X clear image zoom feature also augments this 50 X zoom lens. Auto Focus This is a feature found commonly in many cameras though most do not offer high speed auto modes. This camera however is able to support high speed auto modes that can help in times when you need to quickly takes some photographs and you are left with little or no time to manually set the values. Optical Steadiness This camera is equipped with features that help in steadying your image so that you can take beautiful shots across a wide range of optical situations. Optical Steady Shot will help in high speed subjects that would otherwise look blurred. Manual Controls This is one camera that is a point and shoot as well as a DSLR in some ways. This device is able to provide you with manual controls that will allow you to set values for taking photos in a creative way that could otherwise be possible only on a DSLR camera. You can also get continuous shooting modes with 10 fps speed. This is a great function as it allows you to get creative with your projects. Other Features Full HD Movie recording is possible with the camera thanks to the advanced sensor and high performance lens that it comes equipped with. This camera comes with a 3.0-Type Xtra Fine LCD panel that can be used to view all your images and your subjects before and after clicking the picture..The product Sony Cyber-shot DSC-HX300 Point & Shoot Camera is from the famous brand Sony. The product is currently available with the amazing discount from FlipKart.Currently a discount of 13.0% available for this product. Great discount for this product which has the original price of Rs.24990.0 and you get these amazing products for a discounted price of Rs.21499.0. Hurry up. Stock may be limited.